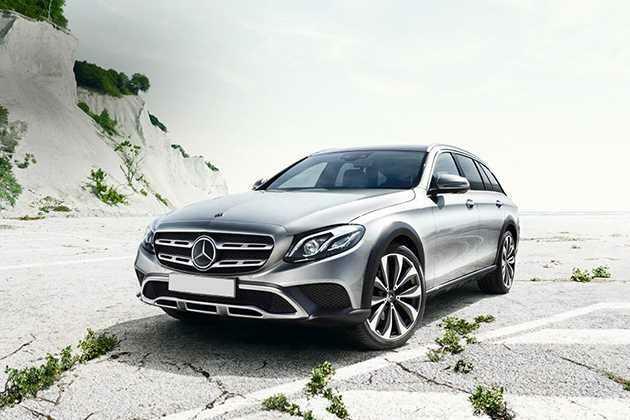 The stunning saloon, Mercedes-Benz E-Class is a favorite of numerous car enthusiasts. This model has undergone a facelift and now it comes with some new interior aspects. Among its few variants, Mercedes-Benz E-Class E 200 CGI is the only one to have been incorporated with a petrol engine. This turbocharged mill can generate a peak power of 181bhp besides yielding torque output of 300Nm. It is skillfully coupled with a 7G-tronic plus automatic transmission gear box that aids in easier gear shifting. No changes are made to its exteriors and it comes with the same chrome treated radiator grille at front featuring the brand's logo in its center. Then there is a wide windshield integrated with a couple of intermittent wipers. On the sides, it includes stylish wing mirrors as well as a modish set of alloy wheels that further adds to its stylishness. Meanwhile, in the rear end it has striking aspects like bright LED brake lights, boot lid with a chrome strip and body colored bumper as well. In terms of interiors, it includes some new features like the Telematics multimedia system with Navi ready function, Garmin MAP PILOT navigation and a high resolution color media display of 20.3cms. Besides these, it is packed with all other standard aspects such as leather covered well cushioned seats, steering wheel, storage spaces and a roomy boot compartment. The manufacturer has also loaded it with various security features that guarantees safe driving experience. The sleek body, stylish aspects and the expressive lines brings this saloon an impressive overall appearance. At front, it has a large windscreen that is equipped with intermittent wipers. Next comes the bonnet, which is neatly designed, while the aggressive radiator grille has two chrome plated slats. It is surrounded by a trendy headlight cluster that includes turn indicators as well as LED daytime running lights. Below this is a body colored bumper, which is fitted with an airdam and two air ducts on either side. Also, it comes with a chin spoiler that further augments the look of its front facade. Its side profile looks quite modish with stylish door handles, and external wing mirrors that are integrated with side turn blinkers. Another aspect is the flared up wheel arches that are fitted with an elegant set of 17 inch alloy wheels, which are further covered with high gripped tubeless tyres. Its rear end has a sophisticated look with aspects like a well designed tail light cluster integrated with turn indicators and a boot lid that has company's badge engraved on it. Besides these, it also includes a windscreen with defogger and two chrome finished exhaust pipes that gives it a rich appeal. The internal section of this latest version is quite spacious and elegantly designed. The cabin is decorated with sturdy material, whereas the dual tone color scheme further gives it a lavish look. The automaker has incorporated ergonomically designed seats inside, which are covered with premium leather upholstery. These are integrated with headrests and come with electrical adjustment function. On the dashboard and door panels, the open pore brown ash wood inserts looks quite captivating. A three spoke designed, multi-functional steering wheel as well as gear shift knob both are wrapped with leather. The modern instrument cluster aids in providing updates about the vehicle, whereas the center console includes centrally positioned analogue clock with a display. Apart from these, the cabin is also bestowed with aspects like cup holders, storage pockets on door trims, spacious glove box compartment, AC vents, tachometer, ashtray package, ambient lighting and many other such interesting features. This variant is powered by a 2.0-litre, in-line petrol engine that delivers an exceptional performance. It carries 4-cylinders that are fitted with 16 valves and has a total displacement capacity of 1991cc. This is a turbocharged motor, which is integrated with a direct fuel injection system and is based on the rear wheel drive mechanism. The peak power comes to 181.03bhp at 5500rpm in combination with 300Nm torque output in the range of 1200 to 4000rpm. This mill is coupled with an efficient 7G-tronic plus 7-speed automatic transmission gear box. It can return a maximum fuel economy of around 12 Kmpl, which comes down to approximately 8 Kmpl, when driven under city traffic conditions. Moreover, this power train propels it to achieve an impressive speed of nearly 233 Kmph and accelerates from 0 to 100 Kmph in just about 7.9 seconds. It is bestowed with a reliable braking system, wherein its front wheels are fitted with a set of ventilated disc brakes and the rear ones get solid disc brakes. These are further accompanied by anti-lock braking system and brake assist function, which improves this mechanism further. The direct control suspension featuring selective damping system is assembled on both its axles, which aids in maintaining its stability at all times. Meanwhile, a speed sensitive steering system does its job of handling the vehicle effectively, by offering excellent response. It not just supports the turning radius, but also keeps it under control irrespective of road conditions. One of the best things about this saloon is its availability with numerous comfort features. The new Telematics system with a navigation ready function remains its main highlight. It comes along with a color display and supports USB ports as well as SD card slot as well. It is bestowed with an advanced air conditioning unit with automatic climate control, whereas sunvisors are offered with illuminated vanity mirrors. The instrument cluster alerts the driver by giving out notifications about fuel consumption, vehicle speed, outside temperature, gear shift position and a few others. Another key aspect is the panoramic sliding electric sunroof that lets in sunlight and fresh air. Other than these, the list also includes, active park assist system, reverse camera, electric sun blinds, trip computer, auto dimming inside rear view mirror, electrically adjustable seats with lumbar support and many others that adds to their level of convenience. The safety standards is quite good and ensures maximum protection. The list of features include driver's seat belt warning lamp, dual front airbags, NECK-PRO crash responsive head restraints, and anti-lock braking system. It also comes with supplemental restraint system that includes crash responsive emergency lighting, tension seat belts, activation of hazard warning lamps and a few others. 1. Plush internal section with sophisticated features. 1. Low ground clearance is a disadvantage. 2. Price tag is quite expensive.